Desmond Bullen revisits ‘days of hormone and heartbreak’ as Tracey Thorn and Dave Haslam share a few of their favourite songs for Jukebox Choice. This – thank heavens – isn’t ‘rock and roll’, yet Gorilla’s decommissioned nuclear bunker décor has just the same conjured up a gig-giddiness amongst its midlife critics, all sensible clothes and smartphones, reliving their youth in their collective nostalgia for it. There is an urgent press at the Hooch-stocked bar, and – filling out the illusion of a concert – a playlist of the kind that would once have been painstakingly committed to cassette tape before the headliners take to the stage. When they do, it is in a shuffle of diffidence and glamour rather than strobe lights and power chords. 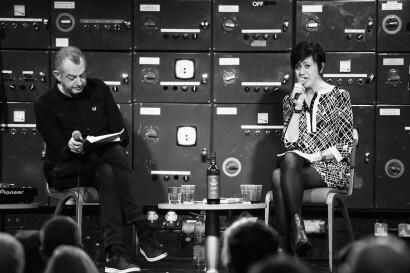 On the face of it, Tracey Thorn and Dave Haslam epitomise two contrary traditions; the reclusive and the inclusive. For all that the former has deigned to sway beneath the fractured light of the mirrorball, her native land is a more melancholy terrain. Likewise, in spite of Mr. Haslam’s germination in fanzine culture, he has grown into a naturalised citizen of club country. The apparent dichotomy is reflected in the subject matter of their respective books. Ms. Thorn’s, Naked At The Albert Hall, is a thoughtful disquisition on the arts and artifices of singing, straight from the larynx of one of pop’s most evocative voices. Life After Dark, on the other hand, is a celebration of the nightclub as a catalyser of cultural change, brewing alternatives from the alchemy of repetitive rhythms and altered states. In this way, of course, they have the foundations of a classic double act; one honed – it emerges – on biographies that have intersected over more than three decades. The conceit of the evening is that each will select five songs that encapsulate the music they lose themselves in, like some 6 Music riposte to Desert Island Discs, underscored by an amicable rivalry. It makes for an experience that is at once awkward and cosy, as the audience nod along with Tracey and Dave, listening with others to songs that – in the main – have lodged with them since their early days of hormones and heartbreak. It’s what music does, whether in basement flat or discotheque; unfetters the listener from the tyranny of time and space, affording them a transient transcendence. What Mr. Haslam’s thesis overlooks is that, for those more wallflower than wildflower, it is the club of How Soon Is Now? which oppresses with its insistence on the ecstasies of the extrovert, when common cause might not necessitate a literal common ground. In just that way the ineffable sadness in Karen Carpenter’s voice as she bids Goodbye To Love (one of Ms. Thorn’s selections) has a meaning outside its context that a ‘banger’ without a club conspicuously lacks. In the end, though, it’s a matter of one’s sensibility, whether sentimental or sensuous. The final queue – for the equivalent of autographs at the stage door – suggests both have been satisfied. Desmond Bullen’s poem, Cheer Up, Wigan’s Rose was performed live by Hacker T. Dog on CBBC. He was recently un-followed by Janet Ellis on Twitter.